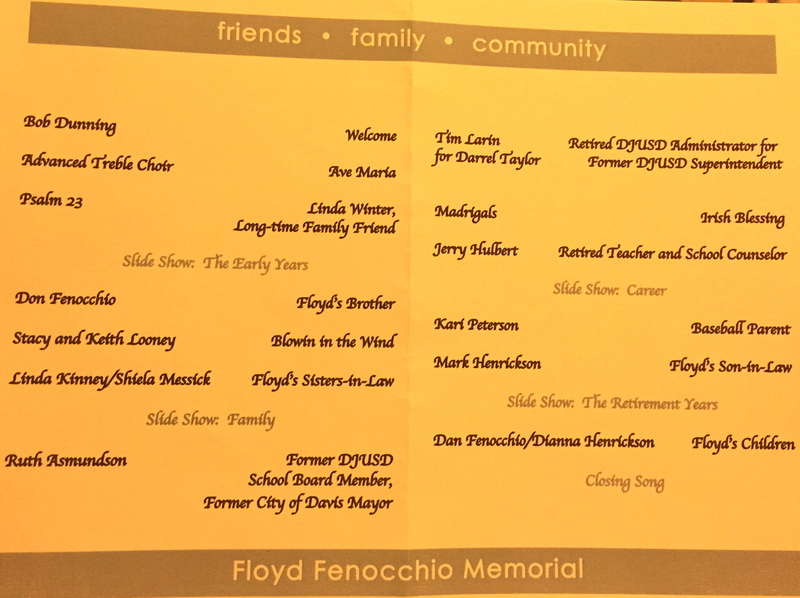 The community said goodbye to Floyd Fenocchio tonight, and wow, what a loving tribute to a man and a life beautifully lived. Seventy-six was way too young. There was so much more life to live, so much that will unfold yet that he would have wanted to see and be a part of, so much yet to give to his family, his friends, his community. And Floyd? He was so fit and young at heart and active and happy. The heart can be a fickle organ. I was so incredibly pleased to be asked to speak about our dear friend on behalf of our baseball community. And it was my great honor to do it. Here’s the program which was such a perfect blend of family, friends, colleagues, music and photos. Bob Dunning captured Floyd so well in his introduction and comments made throughout the program. Floyd’s brother and sisters-in-law were achingly sweet and their comments heartfelt. Linda’s reciting of the 23rd Psalm was powerful and her comments so gracious. Mark’s comments and especially the photos he chose and arranged and set to music told beautiful stories, each one so very moving. I’ll paste the comments I made at the end of this post. Writing about Floyd came so easily. I learned a lot about Floyd tonight… he was a sailor for one thing. For another: he was as genuinely kind, honorable and tenderhearted from the get go as he was in his later years. And he was universally loved; it is absolutely true that each person who knew him felt a special and unique connection to Floyd, and I believe each of those connections was genuine. That is a lot of love. And he loved the song Blowing in the Wind. That’s awesome. It was touching when his son Dan talked about how, when a kid is growing up, he looks up to his parents as perfect, flawless beings, but as those kids grow older they see their parents’ flaws and imperfections. He went on to say his dad remained the generous, devoted dad he had been to him as a child, every bit as attentive and loving in later years as when Dan was growing up. I can say this: the boys were lucky to have Floyd in their dugout, in all respects. They went from kids to young men on Floyd’s watch. There could be no greater gift. 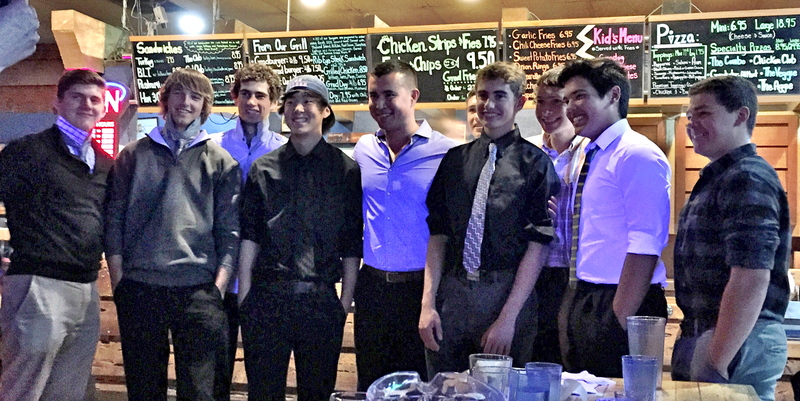 James, Daniel (Floyd’s grandson), Solly, Alex, Coach Tim (now living and working in San Francisco), Eric, Peter, Andrew, Ray and Mason. These guys have been together a long time. So, this is the sixth draft of the comments I shared tonight (minus a few extemporaneous comments here and there). Sixth draft because I kept editing the comments down in order to stay close to my allotted time. Much great stuff is on the cutting room floor… I could have talked for an hour with all the memories and stories I gathered from the other parents. It was a very moving process. I have been identified in the program as “baseball parent” and asked to speak on behalf of Floyd’s baseball community. It’s a Floyd Fan Club of a baseball community. Baseball was a really huge part of Floyd’s life, for his whole life, but especially with his grandsons in the last 11-12 years or so. According to Dianna and Mark, these last years were some of the best of his life. In my comments this evening, I’m representing many families of boys who’ve played baseball with Daniel from T-ball to the Davis High School varsity team. But mostly the families of boys who played on Davis Crush, a travel team that Floyd helped coach for four years. But while I’m mostly representing that particular swath of the baseball community, I know the comments I’m going to share are true for Floyd’s other sports communities as well, and his fellow bleacher mates everywhere. So, I contacted the families in our community and asked people to share their favorite memories of Floyd and any words that came to mind that best described him. I looked at all the words and memories that people came up with and noticed that most of them started with a letter in Floyd’s name. So that’s how I decided to organize the comments and good words. F L O Y D… so what do those letters stand for? F is for FRIEND. 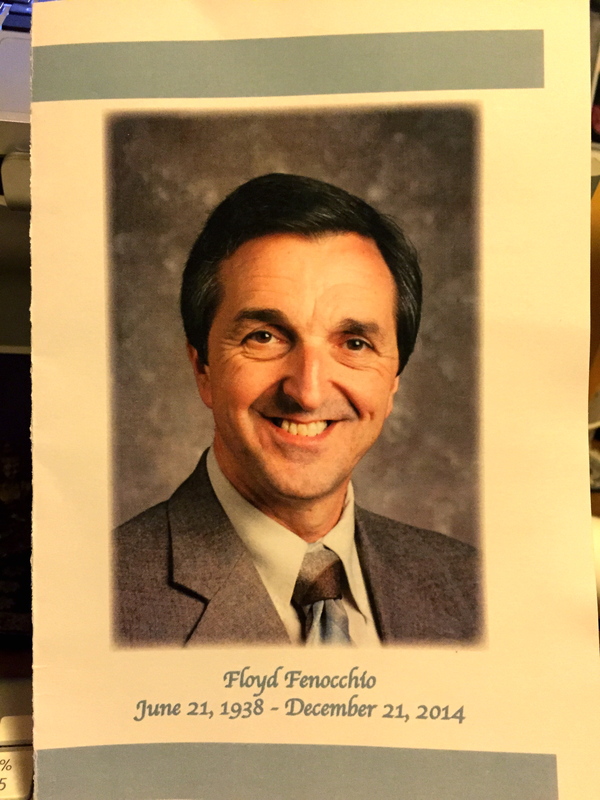 Floyd was a genuine, kind friend–to kids and to parents. L Is for LOVE. Floyd loved everyone! And everyone really felt that. He had a way of making people around him feel special and cared for. Theron said, “Floyd LOVED baseball and he loved just being out there–in the field, in the dugout, in the bleachers. It didn’t matter the score, it was always a good day to be alive and watching baseball.” He just loved that. O is for OASIS OF CALM Frances described Floyd as an Oasis of Calm, which was great, because I needed an O word. Floyd was an extremely easy going, roll-with-the-punches guy. Let’s say somebody’s younger sibling was playing kickball against the backstop, during a game, right behind the catcher, and let’s say your son was pitching. You might be going a little bit crazy. Floyd, however, is smiling at that little kid. He may be exchanging a knowing glance with you, but he is tolerant and patient and kind toward that ball-kicking child. He was totally unflappable. If the team had a spectacularly horrible losing streak, it was fine, no cause for worry, they’ll get ’em next time. No matter what, it’s always just a beautiful day for baseball. Attending weekend tournaments for three teams over two days covering half the state? No problem. If you asked Floyd about it, he just chuckled. Nothing but smiles in an oasis of calm. Y is for YOUTHFUL Floyd was fit and lean. And he was a great athlete. He may have been in his 70s but he’d be down there on the field with coaches half his age, or even a third his age. He’d throw with the boys, hit ground balls, catch pitchers, and stand at first base in 100 degree weather. In the bleachers, he was always the first one up to help when somebody arrived with an armload of stuff. He hauled ice chests, rearranged chairs, set up umbrellas and shade structures. And he didn’t lumber and thud down the bleachers like the rest of us, he bounced, and at the bottom, there was always this little dance in his step. I remember that! Watching Floyd run the bases at 70-something years old…it was 360′ feet of pure joy! For him and for us. D is for DEDICATION Floyd was dedicated to the things he loved and cared about. We in the baseball community benefitted greatly from this. – Alex Gutierrez said, “What I always remember is getting to the field early to watch the boys practice and of course Floyd would be there…I would say to Floyd “how’d the practice go?” Floyd would always say “Alex…the boys look good today”. I also remember that. That is exactly what he would say. The other story that showed up on everyone’s list involved Floyd, a tractor, and a certain City-owned baseball diamond in the middle of town with a dirt infield that always required a lot of dragging… but I’m going to let Mark tell that story. There are so many things that come to mind… His smile when he was with the boys, his gentle nature when he explained a play, his way of being upset at an umpire without making anyone uncomfortable, and his hand always on your shoulder as he greeted you. Some people make you a better person just knowing them, and Floyd was one of those rare people. I realize that Floyd was Daniel and Jonah’s grandfather. However, on the baseball field he was a grandfather to all the boys. The hours our boys spent with him on the field, in the batting cages, in the stands, in the car, and over meals throughout the years will continue to be some of the most treasured of their lives. Each and every one of those boys loves Floyd and loved spending time with him. I not only believe that Floyd’s example has been recognized, understood, and so appreciated by these boys, but I believe that they want to live their own lives following his example. Each of them will take a little bit of Floyd out to the rest of the world and we will be all the better for it. I think all of us wish that we could thank Floyd one last time and tell him how much he has meant to all of us. We so loved this man, he will be greatly missed. Overall, Floyd was just a beautiful human being. 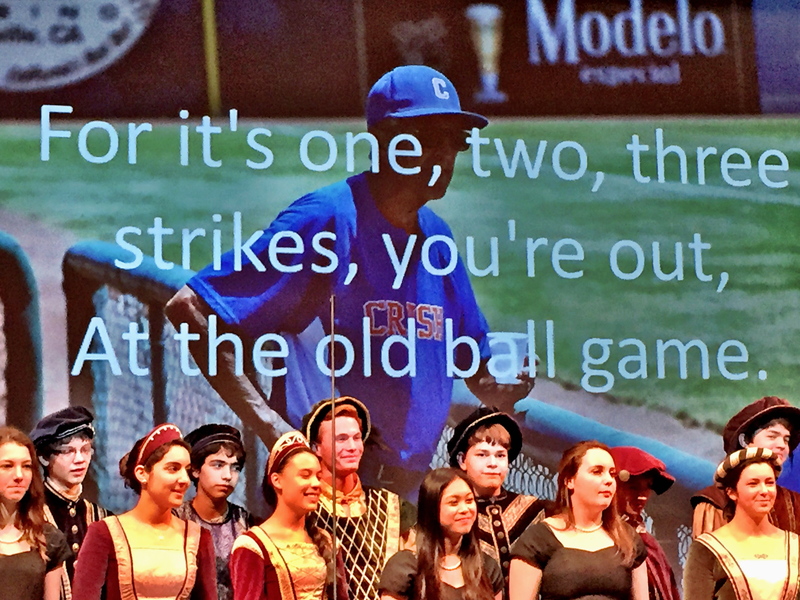 They closed the memorial with the Advanced Treble Choir and Madrigals together singing “Take Me Out to the Ballgame.” The entire hall–some 500 people–stood and sang along. Rest in peace dear friend. And thank you. I mean to say he ran 360 feet around the bases… they were truly feet. But yes, it was a feat! That was wonderful, Kari. I’m so glad I got to read this. I was very sad that I was unable to attend the memorial. It looks like it was a lovely program. We were all so lucky to know Floyd! It was an incredible memorial. He was a great man in every way, from start to finish. He inspires others by his gentleness and kindness. Love is what it’s all about.